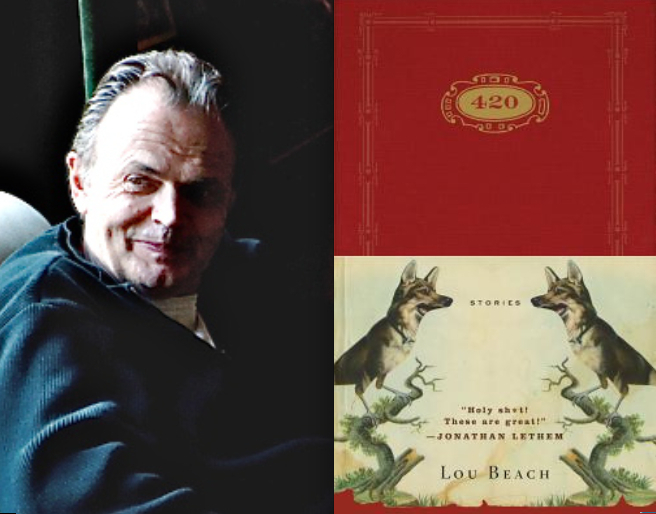 In the 37th in a series of posts on 2011 short story collections entered for The Story Prize, Lou Beach, author of 420 Characters (Houghton Mifflin Harcourt), goes undercover with his dog. Boo is under the blanket. 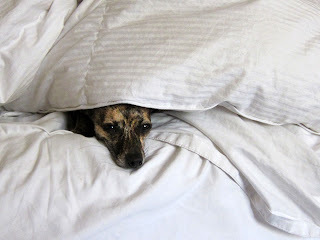 Boo is our brindle Chihuahua, bristly near the tail; the blanket is a faux leopard skin synthetic throw, unnaturally soft. Their patterns clash, a variegated mash-up. She hates the cold more than she hates the mailman and burrows under blankets and pillows and piles of laundry left on the bed to get warm. We cover her with an assortment of pooch blankets and towels and sweatshirts, or place her near the space heater, the wall vent. Today the blanket has been patted into a mound around her, as one would pat a ball of dough for bread, and it resembles a small spotted igloo. Only Boo’s nose sticks out, shiny and moist, and I can see the side of her mouth, the gums pulled back to reveal a row of teeth as sharp and uniform as the cutting edge on a box of tin foil. Her cozy campsite is on the bed near the corner and I get down on my knees and stick my head into the opening, forcing her head back inside. My head now blocks the light but for a few strands that stray in with me. Boo and I are in her dark little cave together, the side of my face touching her flank. I AM my face in here. She makes a funny little sound that I read as either annoyance or resignation or a cocktail of the two, but no warning growl comes from her so I relax for our visit. I read somewhere that a dog’s nose is one thousand times more sensitive than a human’s and I wonder if I have bad breath or if she smells the tuna melt I had an hour ago, or if what a human considers bad breath might in fact be like an air freshener or perfume to a canine. I can smell her body and it’s not an unpleasant odor. She is a clean little dog, not prone to rubbing in dead stuff like our big dogs had done and there is a slightly warm and nutlike quality to her fur. I press my nose to her neck and inhale and push my face against her. She issues a low growl and I stop. Etiquette has been established, protocol defined, and we begin. I tell her how much I like her place, how comfortable it is and thank her for allowing me to visit (not mentioning that I had in fact barged in) and she exhales a little breath and I realize that she too had had some tuna melt a while ago. A bit of light reflects off her eye and I can tell she is looking at me. Dogs are always looking at their humans, reading moods and intentions and expressions, hoping for that lift of the brows that means “Walk” or the shifting in the chair that precedes going to the kitchen, that great temple of treasures. I’m a little dizzy from lack of air but I keep talking to her, complimenting her on the décor, asking what she’s been reading and if her Pilates classes have strengthened her core, does the cat ever visit. I’m getting silly, but I’m easily amused and continue probing her about her financial situation, squirrels or rats (which is harder to catch?) and why she doesn’t like beagles. My glasses are fogging and I close my eyes. I hear the slight whistling breath that indicates Boo has fallen asleep and soon I nod off as well. Someone kicks the bottom of my feet and I wake suddenly and jump up, the leopard skin throw on my head, a wacky kufiya. Boo leaps off the bed and runs down the hall. My wife stands before me, hands on hips, a look on her face that a dog can’t make. “You know,” she says “if you keep this up, you’re going to deprive your brain of oxygen to the point where your already tattered thinking will finally disintegrate. AND you’ll freak that poor little animal to where she’ll bite your nose off one of these days. You’re a grown man, stop fooling around.” She pulls the blanket from my head, drops it on the bed and follows Boo down the hall, into the kitchen. I sit on the edge of the bed and rub my eyes, then stand and rub my stomach. Maybe I should eat something, I think, but they are in the kitchen and I’m feeling a bit chagrined. I lie down and put the leopard skin blanket over my face, close my eyes and continue my story writing exercise, this time with an invisible dog.